After a slow start, this turned into a pretty long day. We had breakfast at the hotel and then hung out in the room. 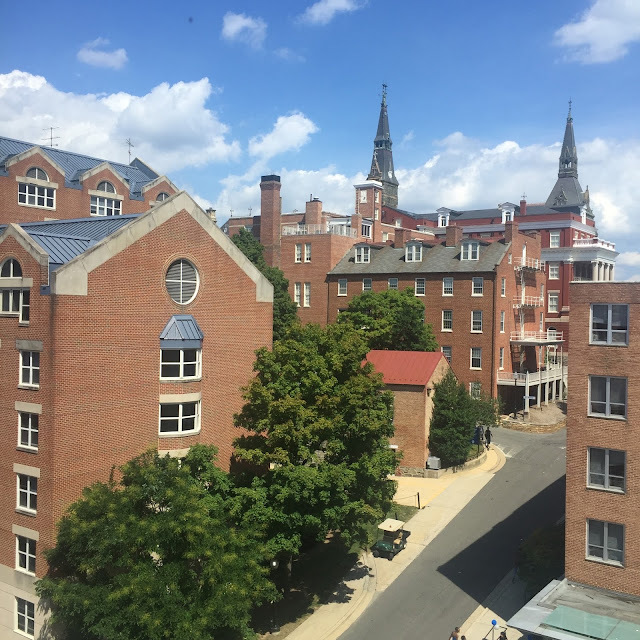 Georgetown assigns you a time to show up and move-in. Jack's time was 12 pm. He heard from a couple of other kids that they weren't checking the time. We eventually decided to take off early from the hotel a little after 11 am. We got to the Georgetown campus and into the queue about 11:30 am. They have it very organized. We were in a long line of cars that snaked around the campus for about 50 minutes. When we finally got to his dorm, a couple of students put all of the stuff in a cart and took it up to the room. Jack is on the fourth floor of New South Hall. Leaving Jack and Sharon, I drove the rental car out of the campus and back around to another line that lead me to parking under the Leavey Center. I hiked back across campus to the dorm. We spent about two hours unpacking the luggage and all of the boxes of stuff that Sharon had drop shipped from Bed, Bath and Beyond. The room is laid out with both of the beds along one wall and the desks and closets on the other wall. About 3 pm, we headed off to get a very late lunch. We tried to get into the Bulldog Tavern, but that turned out to be a mess. After about a 20 minute wait, they put us outside by ourselves in the 95 degree heat and very little shade. We ended up getting up and walking over to the Leavey Center for some sandwiches and burgers. Afterwards, we walked back to his dorm. We got a chance to meet his roommate George and his parents (Peter and Linda). 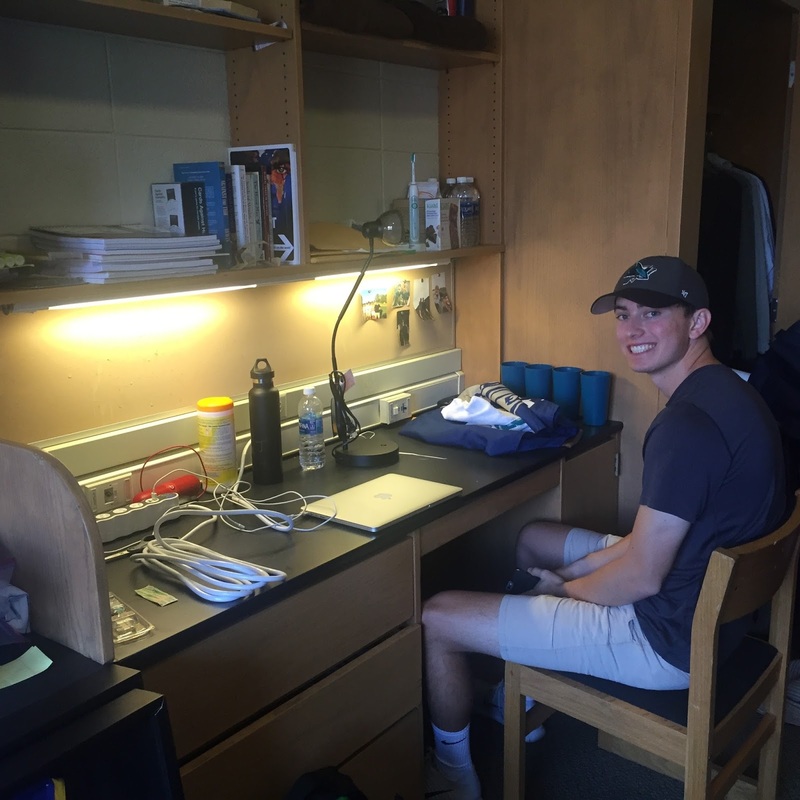 Sharon and Jack spent some more time arranging his room. Jack then helped us drag the three empty suitcases back across campus to the car. Unbelievably, it took almost an hour to get out of the parking garage and heading back to the hotel. Dropping the car back at the hotel, Sharon and I eventually wandered down the block to the Ritz-Carlton. We had a snack in the bar. Using points, we will be staying at this hotel when we come back for the family weekend in October. We eventually caught a cab back to the campus and met Jack near the main gate. The three of us walked into Georgetown and had dinner at Paolo's Ristorante. Sharon had shrimp scampi, while Jack and I had pork risotto. After dinner, we walked back to the campus with Jack. We caught a cab back to the hotel.